Four cottages up from the beach and directly in Seaside proper, you’re sure to see several sandpipers of your own running along the white, sandy beaches of Seaside while staying in our Sandpiper cottage! Inside our cottage you’ll find an inviting living room complete with HD TV, DVD, and iPod/iPad/iPhone docking station. A short hallway away is a kitchen fit for a culinary king! Stainless steel appliances are flanked by designer cabinetry and black corian countertops with a comfortable dining area to sit and enjoy your breakfast before heading out to the beach! A European designed full bathroom (shower only) downstairs alongside the washer/dryer and outside shower complete the main level. Upstairs you’ll find your two bedrooms. The master bedroom has a king bed, brand new flat screen TV, and French doors that take you out to your own private balcony. Enjoy your morning coffee on one of the four Adirondack chairs or your afternoon cocktail after a day of shopping around town! The second bedroom sleeps 4 with one full bed and two twins. Another full European designed bathroom with shower and vintage free-standing bathtub will allow you to enjoy a soak in style! We are located 2 blocks west of the town square and the 4th cottage up from the beach, Sandpiper is a vacationers dream! The swim/tennis/fitness center is at the other end of Savannah Street – only 100 yards away! Beach chairs, umbrella, floats, and other beach toys are provided for you in this non-smoking cottage. This cottage is PET FRIENDLY - Only 20lb or less DOGS allowed. No cats or any other type of animal. This cottage requires Sat- Sat rentals during our high season. My name is Mark Mitchell and my wife, Kathleen, and I are from Atlanta and bought our Seaside cottage, Sandpiper, in 2004. We have 2 daughters,Shannon & Hayley, who are both married now and a son, Trevor. We also have a grandson named Anderson. My eldest daughter, Shannon, and I started a rental management business in Seaside in 2008 and currently manage 30+ properties in Seaside. You can see a complete list of our properties when you click on VIEW ALL LISTINGS. However, Sandpiper is our cottage and where the name of our company originated - Sandpiper Vacation Rentals. Our whole family loves Seaside and our Sandpiper Cottage and we hope you will too! We chose to purchase a condo in Seaside, Florida back in 2002 because we fell in love with the beach town concept. We were also a little star struck with the idea that Jim Carey had stayed in the same condo while filming The Truman Show. Two years later, we were enjoying our time at the condo so much that we decided to purchase Sandpiper for the additional space and proximity to the beach. We also found the layout and bunk room perfect for our 3 kids. Over the years - we've been amazed how well it accommodates our growing family. Our girls and their husbands along with our son are all able to enjoy the cottage together. We especially love the balcony off the master and enjoy many family nights up there with some wine and cheese. And now, even with our first grandson in the mix, we still find space for everyone and the little guy loves the claw foot bath tub! We hope you'll enjoy our cottage and Seaside as much as we do! It truly is our home away from home. Our family had a wonderful break at Seaside in Sandpiper! We'll definitely be back. We were able to get one perfect day at the beach and my girls loved riding bikes the rest of the weekend. There are so many wonderful places to eat on 30A but we had great meals at Red Bar and Local Catch this trip. This is the ideal location, you can't get any better. We are here with our 4 and 5 year old daughters, and we can walk the 40 yards to the beach, and two streets to the town very easily. I agree that the house is smaller than it looks, but perfect for a family of 4 or 5. The top bunk is up against a slanted ceiling, and has very steep ladder, so really only good for a bigger kid or an uncomfortable adult. The coffee maker was broken upon arrival (someone quickly came with a new one), but the TV/DVD player in the bunk room doesn't change channels or work for dvds. The kitchen could use an updating of equipment, not that many dishes, plates, etc if you are staying a week, but it does have everything you need. The beach umbrella provided is not a useable beach umbrella, and the chairs are a little beat up, but we just used the beach chairs and umbrella at the beach that you can rent. There are no screens on the windows to allow a breeze in (i'm sure that's to protect from humidity) but the screened in porch is fantastic. With all of these little things, it doesn't deduct from the amazing location of the house. And, we had a dozen fresh donuts delivered courtesy of the rental agency, huge bonus in the kids eyes:) We would stay here again for sure! Thank you so much for your feedback. We have since added more kitchen items, we have also replaced the bureau in the bunk room and placed a new TV in there that can easily be enjoyed by all. You are right, the top bunk is a tight squeeze for an adult, but most of our kids love sleeping up there as it feels a bit like a fort. The double bottom bunk and extra twin bed provide some extra options if need be. Thank you again for the feedback, we strive to bring the very best service to all of our guests. Come back and see us again soon! Robert P.Where do you live? Our small family really enjoyed the Sandpiper. The cottage is smaller than the pictures looked, but was very adequate for my wife and I along with our 4 yr old and 1 yr old. The kitchen is upgraded and has everything you need. The location is perfect! Only a very short walk from the beach and 2 streets from the center of Seaside. The sandpiper was wonderful! Perfect getaway and highly recommended! 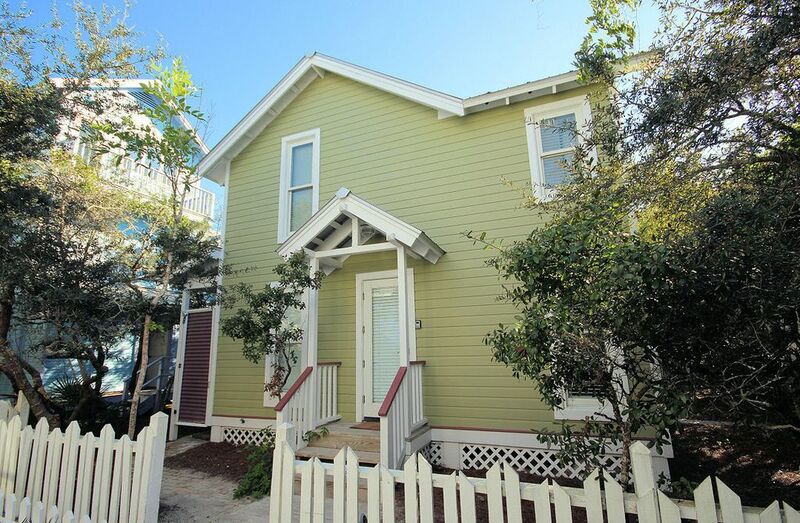 "Sandpiper Cottage" is everything it claims to be plus so much more! The cottage is nestled in the heart of the seaside community but we felt secluded and private with all of the foliage and perfect placement. We walked and biked everywhere and enjoyed the extra amenities. We had a fabulous romantic anniversary getaway thanks to Sandpiper! Thank you so much, we can't wait to come again…..and this time bring the family! We just got back from our wonderful vacation. The house was wonderful, perfect for our family. We have 4 children ages 5, 3, 3, and 6 months. My older boys stayed in one room and my husband and I stayed in the master room with our baby. While the house was a little small for 6 it worked well, because we didn't spend much time in the house! It was a 3 minute walk to the beach with kids and about a 5 minute walk to the center town. My kids had a blast and so did my husband and I. We will be returning!! We had just right accomdations for two adults and 3 teenage girls! The house is perfectly located for quick access to the beach (3 minute walk) and access to the neighborhood fitness and pool accomodations. Two bikes were provided and we got 1 extra so the girls could commute to other areas of town where their friends were staying. Easy walk for them to go to the town center to meet friends for snacks and "hanging out". Accomodations were sufficient for the 5 of us -- everything was nice, clean, and well cared for! Thanks to the Sandpiper Crew for making everything so nice and easy for us! We would definitely return.